What should you look for when seeking a Divorce Attorney? Much of that will be based on how effectively you feel he will manage your divorce. Obviously, if children are involved, there will be child custody issues. If community property is involved, there will be a division of assets. But a good divorce attorney can make all the difference in the world when representing your interests. Here are some things we offer counsel on to those seeking a Divorce Attorney. Our divorce attorneys have an abundance of expertise with all manner of divorce cases, as well as with all of the legal issues which relate to a divorce. Because a divorce case involves the breakup of the family, it can be fraught with emotional decision making by the divorcing parties. That can get in the way of properly resolving the dissolution of the marriage and its related issues. Our firm encourages you to try to leave your emotions aside – and, instead, make sober and responsible decisions about how to resolve your divorce issues. If both parties with do that, it will keep the legal fees and costs down for both sides, which is a good thing. It is better for the divorcing parties to spend their money on themselves and their family, rather than spending it on emotional efforts to “beat” the other side. In the end, nobody hits a grand slam home run in a divorce case. A good divorce attorney recognizes these things, and will protect you from wasting money that could be better spent. Once the divorce petition is filed and served on the other side, there is a statutory 90-day waiting period which must run before your divorce case can be finalized. Our local court system has procedures in place to assist the parties with moving their case along to completion. For example, there is an in-court Mandatory Status Conference process which is designed to keep the court apprised about any particular issues in your case which might require special handling. For another example, the parties will be required to participate in a Mediation, which is designed to assist the parties with reaching a global settlement of all of their issues, so they won’t have to bear the additional time and expense of going to trial. If the parties are unable to resolve their issues via Mediation, their case will be set for a trial – at which a judge will decide how the parties’ various issues will be resolved. (Jury trials are inapplicable to divorce cases.) We will advise and assist you during all of the stages of your case when we become your trusted Divorce Attorney. Washington State is a “community property” state. So, all property obtained by either party during the marriage is presumed to be community property. Likewise, all debts incurred by either party during the marriage are presumed to be community debts. Also, certain types of property are regarded as the separate property of one of the spouses – and certain types of debts are regarded as the separate debts of one of the spouses. Those include property obtained (and debts incurred) by the spouse prior to the wedding date and after the date of the parties physical separation from each other (i.e., when they start living apart). If the parties’ property and debts are going to be divided by the court at trial (rather than by agreement at a Mediation), the court will have before it (for dividing between the parties) all of the parties’ community property and community debt – and all of the parties’ separate property and separate debt. By statute, the court is required to make “ a fair and equitable distribution” of all of the parties’ property and debt. the real estate is sold and the parties will split the sale proceeds. Another example involves certain kinds of investment accounts, e.g., pension accounts, retirement accounts, mutual fund accounts, 401(k) accounts, IRA accounts, and etc. Such investment accounts often are in the name of just one of the spouses. The divorce decree will specify how much of the investment account is to be allocated to the other spouse. The allocation to the other spouse is then effected with a Qualified Domestic Relations Order – which is commonly referred to as a QDRO. The QDRO is a court order that is directed to the plan administrator of the investment account. So, for example, if the husband has $300,000 in a 401(k) account through his employment, and the divorce decree awards half of his 401(k) account to the wife, the QDRO will direct the plan administrator for the husband’s existing 401(k) account to create a new and separate 401(k) account in the wife’s name only – and the QDRO will direct the plan administrator to fund the wife’s new and separate 401(k) account with $150,000 from the husbands existing 401(k) account . In this example, each party would then have their own, separate 401(k) account, each with $150,000 in it. In the end, all of the parties’ personal property, bank accounts, real estate, investment accounts, and debts will be divided between them. The more property and debt the parties have, the more complicated the divorce process can be. A Divorce Attorney working in your best interests will be very knowledgeable about anything and everything to do with property settlement and division of community assets. If you and your spouse have any minor children together, child custody is going to be an issue, and in all likelihood, a Parenting Plan will be entered in your divorce case. A Parenting Plan is a court order which specifies when the minor children will spend time with each parent (child custody and visitation privileges). In the Parenting Plan, one parent will be designated the “primary residential parent” and the other parent will be designated the “visiting” parent. 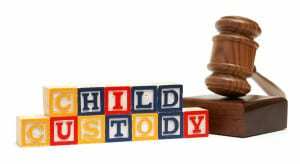 The primary residential parent is the parent with whom the minor children will reside a majority of the time – in other words, they will have primary child custody. The Parenting Pan will specify when the minor children will spend time with the visiting parent. Those specifications will address weekly visitations, holiday visitations, visitations during the children’s and the parent’s birthdays and other special occasions, school break visitations, Summer visitations, and etc. Unless there are reasons not to do so, typically, the Parenting Plan will specify that both parents will have “joint decision making” with respect to which schools the children will attend, which kind of religious upbringing the children will have, and what kinds of non-emergency medical or dental procedures may be undertaken for the children (e.g., elective orthodontia). In Washington State, grandparents have no legal rights to visitation. A thorny issue can arise after the divorce is finalized – i.e., after the Final Parenting Plan has been entered: relocation. Relocation is where the primary residential parent wants to move away (perhaps very far away) with the minor children. Because doing so can tremendously undermine the visiting parent’s opportunities to spend time with the children, the primary residential parent must apply for a court order authorizing any such move. The court will address certain statutorily designated factors in determining whether to authorize the primary residential parent to move away with the minor children. As your divorce attorney, we can advise you on these weighty matters. Nothing is more important in a divorce than the children, and everything a divorce attorney does should ensure the children are well taken care of. Along with any child custody orders, the court will require an Order of Child Support to be entered to provide financial support for the minor children. Because this issue involves the parties’ finances, the parties will be required to produce their last 2 year’s tax returns and written verification of their last 6 months of income. The parties’ income figures are then used to generate the Child Support Worksheets. Although, theoretically, this can be done manually, that is very hard to do (especially to do it correctly). We have the FamilySoft® software, which is continually updated by the manufacturer, to accomplish the task. The Child Support Worksheets will identify the monthly amount of child support that the visiting parent will be required to pay to the primary residential parent for the financial support of the children. Then, the court will enter its Order of Child Support reflecting that monthly child support obligation. The Order of Child Support will also address some other, related issues. For example, it will specify when the visiting parent’s child support obligation will end; that is typically “when the child turns 18 or graduates from high school, whichever is later.” Also, the Order of Child Support will specify, for the future years, which parent will be able to claim which children for the dependent exemption on their tax returns. Also, it will require the parents to provide medical insurance, where available – and pay a specified portion of uncovered medical expenses – for the children. Also, it will specify how (and by when) either parent can have the issue of “post-secondary educational support” addressed by the court with respect to a child. Post-secondary education support refers to the parents’ obligations to financially assist their child with trade school or college expenses, even after the child no longer is a minor. Spousal maintenance (sometimes referred to as spousal support) is another issue which the court might be called upon to address in a divorce case. of course, one of the problems a divorce creates is that the two parties now must live separately – and, overall, it is more expensive for two to live separately than together. So, if the two parties have an appreciable difference in income, the lesser-income spouse might ask the court for an award of spousal maintenance. A spousal maintenance award of a required duration typically will end sooner upon (1) the death of either party or (2) the remarriage of the party receiving the spousal maintenance. Spousal maintenance payments, unlike child support payments, are regarded as an income-shifting mechanism. So, the party paying the spousal maintenance gets to deduct the payments for income tax purposes. Therefore, the party receiving the spousal maintenance must declare the payments as income for tax purposes. As you can see, going through a divorce can be a very complicated and emotionally straining process. Many issues in addition to those discussed above can arise. With our abundance of expertise with divorce cases, our divorce attorneys will reasonably guide you through the entire divorce process. Divorce is a painful experience for all parties involved, and a good divorce attorney can guide and lead you through the emotional path of divorce and keep you focused on the end result, particularly in child custody disputes or dissolution of property orders. An empathetic divorce attorney can make all the difference in the world to your divorce case. Our Tri-cities Divorce attorneys service all areas of southeast Washington, including Kennewick, Pasco, Richland, and West Richland, as well as Benton and Franklin Counties. Similarly, our legal services are available to a all of Washington State.